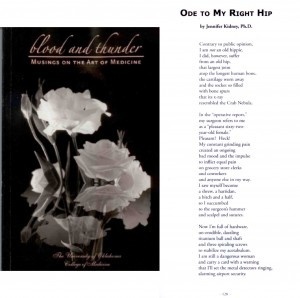 Home / News / “Ode To My Right Hip” – Jennifer Kidney Ph.D.
“Ode To My Right Hip” – Jennifer Kidney Ph.D.
“Ode To My Right Hip” By Jennifer Kidney Ph.D. I recently had the pleasure of meeting the passionate Ms. Kidney one afternoon in October during our spirit week at the clinic. A poem called, Ode To My Right Hip,passed through the clinic a few weeks prior and ended up in my delighted hands. The Yale Ph.D. graduate had been featured in The University of Oklahoma College of Medicine’s, Blood and Thunder – Musings On The Art of Medicine, little under a decade ago. The magazine is a student-run literary journal aiming to unite the human experience with the healthcare profession. The published poem was an ode to the hip-replacement Kidney had received from Steven Schultz, Ph. D.
Jennifer Kidney was born in West Virginia; a very adventurous young woman who found her way to Oklahoma. Her passion for geology, birds and nature are just a few hobbies that Kidney has kept throughout her entire life. As a young adult the unhopeful choice of a degree in geology led her to a full fellowship-scholarship in English Literature and the rest soon fell into place. Kidney’s profession as an adjunct creative writing professor has opened the door for her to travel and live in many different locations throughout the United States. In 2008-2009, the professor received her right-hip surgery from Schultz after a close call from another doctor. At first, the doctor and Kidney thought the problem lied in her back. Once she was referred to The Orthopaedic and Sports Medicine’s specialist, Dr. Schultz, he insured her that the problem might in fact be her hip. Post surgery, Jennifer received another MRI that looked as if the hip-flexor might have been cracked due to the replacement. Few days later they did another scan and Kidney referred to it as a “miracle” as Dr. Schultz just left all the thanks to medicine. A hip-replacement became more than just a new part of Kidney. It gave her the ability to go out and do the things she loves the most. Dr. Kidney now spends more of her time outside bird watching. She also travels frequently to Ada, Oklahoma, to deliver collected books for others in need. For the past 22 years Kidney has been aiding the Oklahoma Humanities Council “Let’s Talk About It Oklahoma.” Since being treated at our clinic, not only has Jennifer continued to judge local poetry contests, but also rekindled the fire for her love of bird watching. Hip pain had limited Kidney from experiencing everything that brought joy to her life. Jennifer understood the replacement was not going to just give her the old life back. The replacement was going to give Kidney another chance at a stronger foundation to continue to do the things she cherishes most.